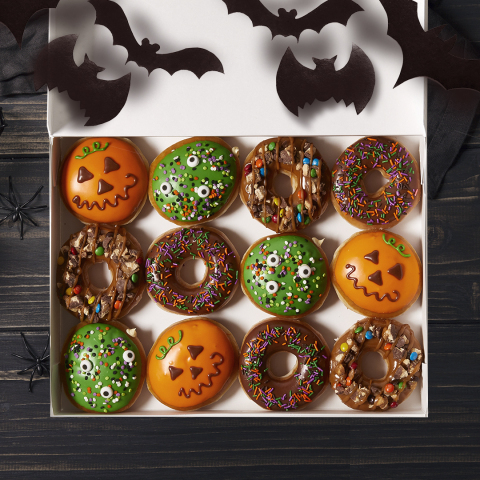 WINSTON-SALEM, N.C.--(BUSINESS WIRE)--Doughnut and candy lovers need to look no further than Krispy Kreme Doughnuts for the ultimate treats this Halloween season! A spooky new collection of crave-worthy doughnuts are available today through Oct. 31, at participating U.S. Krispy Kreme shops. To complete the season of fun, Krispy Kreme is also hosting the ultimate costume party! Wear your costume on Oct. 31 to get a FREE doughnut of choice at participating U.S. Krispy Kreme shops. Show us how you’re celebrating Halloween with Krispy Kreme Doughnuts throughout October by using #KrispyKreme and tagging @krispykreme on social media.